The easiest decision Sean McDermott has to make after the first two preseason games is who to start the third preseason game against the Cincinnati Bengals next Sunday at New Era Field. AJ McCarron’s hairline fracture in his shoulder has left just two quarterbacks standing, in Nathan Peterman and Josh Allen. Allen needs to start the contest against Cincinnati. Nathan Peterman and Josh Allen have been both impressive through two preseason games. Peterman is 17 of 20 for 232 yards with 2 touchdowns and one interception. Allen is 18 of 32 for 176 yards with 2 touchdowns and no interceptions. The difference is Allen hasn’t had a chance to play with the number ones yet. Now I’m not saying that everything will go well when Allen plays with the number one’s. AJ McCarron’s performance against the Browns wasn’t his entire fault. The offensive line had serious issues and gave McCarron little help. But isn’t this exactly what we need to Allen perform with? We know who Peterman is. We’ve seen him play with the number one’s and even start a few games last year. What we don’t know is how Josh Allen will perform with the one’s. One thing that is plain to see for all is the difference in the two players ability. Allen’s ball has so much zip on it. His touchdown pass to Rod Streater was a thing of beauty. His ability to avoid a man that came clean through the line and then on the run throw a bullet to Streater was impressive. Another issue that can’t be discounted is Allen’s ability to move. As mentioned above this offensive line was not impressive in Cleveland. You need to ask yourself which quarterback would be able to avoid the rush better if the offensive line is going to struggle in a few games. The answer is Allen. His ability to move and avoid the rush and gain a few yards with his legs far exceeds Peterman’s ability. Neither man is Tyrod Taylor in that category but Allen clearly has an edge in my eyes. The third preseason game is usually the showcase for the regular season opener. The Bengals will probable play their starters on defense for the first half. I think I speak for the Bills Mafia that Allen needs to be the starter for the first half. We need to see what the man can do. And if he shows a competency like he has in the first two preseason games, then he needs to start the opener in Baltimore. Ask yourself this question: If you were a Ravens fan which quarterback do you fear most? I think it would be Allen. He’s the guy that can throw the ball 60 yards in the air. He’s the guy with the ability to avoid the rush. He’s the guy with a cannon for an arm that can throw the ball through two defenders like his TD pass to Ray Ray McCloud in the first game. Sean McDermott has many tough decisions to make as head coach of the Bills. This one is an easy one. 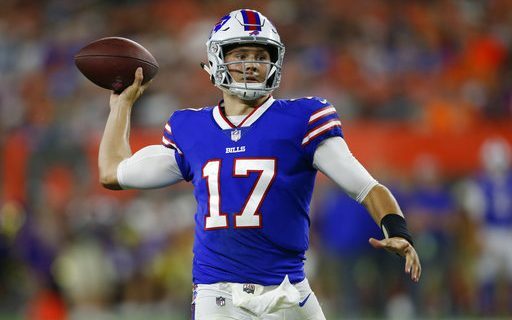 Start Josh Allen now!